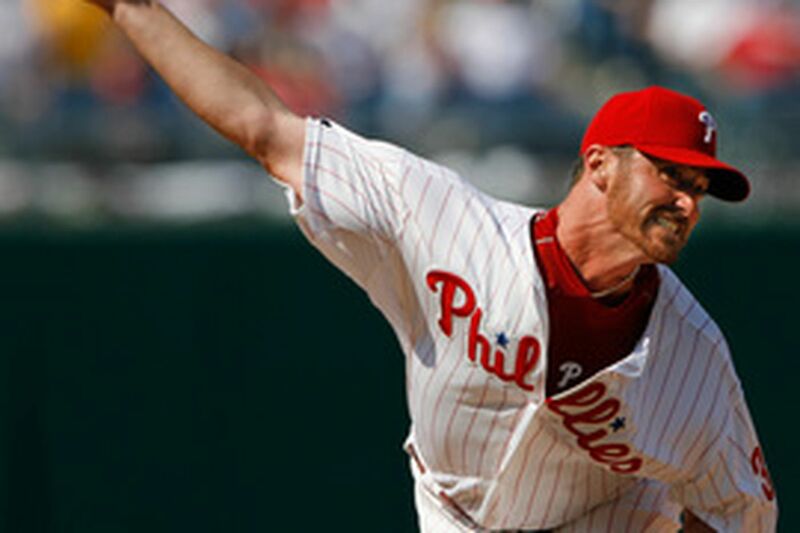 Phillies pitcher Brett Myers delivers against the Braves. "Surprisingly, I was more focused than amped up today," Myers said. "I was trying to make pitches rather than just throw it by the guy." This is how Brett Myers imagined it, and this is how it was happening: Two strikes on the batter, the crowd standing, shrieking, anticipating the strikeout like a lion anticipates dinner when the cage door is rattled. This is not how Myers imagined it, but this is what was happening next: The fastball, when Edgar Renteria was surely looking off-speed, staying over the middle of the plate rather than drifting away from the batter, the swing, and then Myers' not needing to turn around to see the outcome. The difference in baseball between what you imagine and what you get is just that narrow, the difference of one pitch that refuses to behave, one opportunity to put away a game that ends up rattling off the brick wall in straightaway center field. "I was waiting for the boo," Myers said, but the opening-day sellout crowd liked what the starter had done too much. The crowd just sat down quietly and prepared for the rest. "I hope they stick with us," Myers said, "because it's going to be a long year and it's not always going to be pretty. We need them to be with us through good and bad. They could make us or break us." The Phillies took their followers through both good and bad yesterday, a couple of times. They fell behind early, rallied to take a 3-2 lead, then surrendered the game when Myers gave up the tying home run to Renteria in the eighth, and reliever Ryan Madson allowed the game-winner, also to Renteria, in the 10th inning. It wasn't all about the pitching yesterday. The Phillies' heralded offense had its chances to break open the game, too, and came up wanting against John Smoltz and a variety of Atlanta Braves relievers. In the seventh inning, the Phils put leadoff hitters at second and third - with 2-3-4 in the batting order coming up - and couldn't get a run home. They had the winning run on second in the ninth, with Chase Utley at the plate, but didn't convert. Stuff like that. But everything always comes back to the guy holding the ball, and, aside from the outcome, Myers had a very good start to the season. If he pitches like that all year, he'll win 20 games or come awfully close. "I thought I made four mistakes," Myers said. "I walked Chipper [Jones] twice, made a mistake to [Brian] McCann [a two-run home run in the fourth] and the mistake to Renteria. Other than those, I felt pretty good, but I seem to dwell on the bad things, and that's what's going to make me better." The Phillies, however, have to figure out a way to make the bullpen better. It is pointless to second-guess the decision to let Myers pitch the eighth with the one-run lead, but if the Phils had a lights-out setup guy, that's the pitcher manager Charlie Manuel would have used instead. He hasn't got one of those, so that's the way he managed. Given the circumstance, letting Myers remain in the game is understandable. Even after 95 pitches, he's better than the alternative. That isn't the case with most of the other starters, though, and if the bullpen can't be trusted, that will become a big problem. "Hey, it's the first game and we battled our tails off today," Myers said. "We were down, 2-0, to John Smoltz, who was filthy. We got some big hits to get us back in the game, to get me back in the game to where I could compete. We wanted to win more than anything. It just didn't happen." You can't blame Myers. He did enough to win the game. At 26, he is the youngest opening-day starter for the Phillies since Bruce Ruffin, the pitcher who replaced Steve Carlton on the roster but nowhere else. Myers has always been able to throw, but now he's also learning to pitch a sharp game. "Surprisingly, I was more focused than amped up today," said Myers, who has occasionally gotten too emotionally involved on the mound. "I was trying to make pitches rather than just throw it by the guy." So the delivery to Renteria wasn't bad because it was a fastball, a try-to-hit-this pitch, but because it stayed in the fat part of the hitting zone and Renteria buried it. "It's the big leagues. Anybody can do that," Myers said. "You make mistakes here, they come back at you." That also applies to the front office. You make mistakes in evaluating your bullpen and those will come back at you as well. It is the difference between what you imagine and what you get, what you hope for and what actually occurs. It is the difference between handing the ball to a fresh arm that can get you most of the way home and watching that same ball thud dully off the distant bricks.